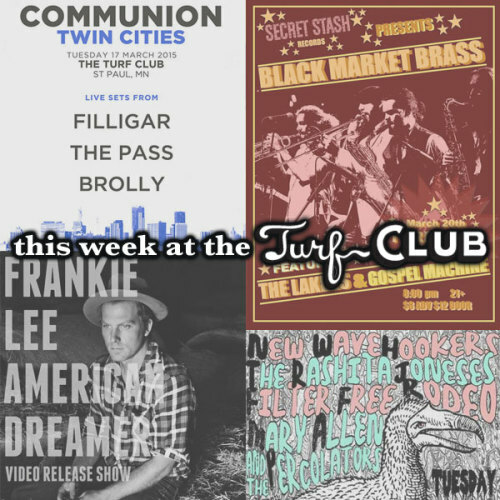 At the Turf Tuesday night will be a trio of bands including Filligar, an alternative/indie rock band recently described as “one of the best young bands in America.” They have toured to enthusiastic audiences all over the world—from North and South America to Europe and the Middle East. Filligar's latest record Hexagon (Decade Records, 2013) was named “Best New Music” by American Songwriter Magazine and “a fresh take on indie rock” by Paste Magazine, while their previous release was nominated for “Best Rock Album” at the 2012 Independent Music Awards. By appointment of the U.S. State Department, Filligar has served as cultural ambassadors representing “the best of the U.S.
Louisville, KY's The Pass tout a “never-ending quest for a balanced perfection of synthesizer pop and dance-floor psychedelia.” Mere twentysomethings, they are already expert organizers of a barrage of sound that would be otherwise easy to let derail. Thanks, they say, to endless nights in a basement sound laboratory and influence by the likes of Justice, LCD Soundsystem, Daft Punk and '80s synth-pop. The Pass are half from Jersey and half from Kentucky. Kyle Peters and Will Roberts played in garage bands in the former; Brian Healey and Neil Lucas honed their craft in the latter. Brolly is an ambient indie rock band based out of Denver, Colorado comprised of a group of friends from California, Colorado, and Australia. The band began in 2011 from the songwriting of vocalist Jacob Ithurburn and ambient guitar tones of childhood friend Cody Martin. The two were joined by drummer Kristen Famularo, and keyboard player Chelsea Famularo who became fast friends with Ithurburn during his travels abroad in New Zealand. Kitty Kitty Bang Bang are at the Turf Wednesday to perform what they would call, original lady-flavored basement rock. In addition to the night's lineup will be Rebel Queens, a high energy all female rock band performing classic rock & punk. To round out the trio for the night, Verretta, a two-piece band including Dan Veverka, “Danny V.”, a self-taught musician hailing from the sprawling metropolis known as Austin, MN. Dan learned to play drums by playing along to songs by Rush, Led Zeppelin, Van Halen, etc. His singer, Tony Crispigna, "Tony C." or "TC", is a self-taught musician hailing from the dynamic beauty of the Upper Peninsula of Michigan. Cornmeal has never been a band to shy away from reinvention and after over a decade, 2013 proves to be just that as the band sets out with a newly reformed lineup, a fresh energetic sound and heads back into the studio to finish their long awaited first studio album after almost 6 years. A nationally recognized live music institution, Cornmeal is heavily influenced by American roots and folk music and seamlessly blends lightning fast tempos and impeccable harmonies into an unrivaled live performance that continues to expand upon the five-piece acoustic-electric groups' vast musical repertoire. While steeped in the tradition of the past, Cornmeal continues to forge a path all their own, pushing the boundaries of bluegrass, Americana and folk for a whole new generation of music lovers. With a growing fan base and ever-evolving sound, Cornmeal challenges the recipe of bluegrass and live performance. With the release of their debut album, In The Kitchen (2001 Livin' Live records), Cornmeal secured its place as one of the top bands in its genre. 2003's Tales from Magic Stone Mountain (Livin' Live records) garnered much critical attention and became a staple on College and AAA top 10 lists throughout the country. In May of 2006, Cornmeal released their third album, Feet First, which became proof positive that Cornmeal's tenure on the road brought on an honest and mature sound. Produced by former guitarist Kris Nowak and bassist Chris Gangi, Feet First features a strong confidence in songwriting, musicianship and the ability of this band to stylistically ride the fence and bring it back home without missing a step. Black Market Brass is a Minneapolis-based group performing their own brand of originally composed Afrobeat/Afrofunk music, as well as completing authentic renditions of the classic 1970's West African sound. Taking their cues from the godfathers, the band draws on complex polyrhythmic percussion, driving bass lines, dizzying guitar interplay, rolling keyboards, and room-commanding brass. The result? An eclectic blend of cool deep funk and driving Afrobeat grooves that will lure you to the dance floor and never let you leave. Gospel Machine is garage gospel band out of Northeast Minneapolis resurrecting the soul and R&B styles of the 1960's. The band features Jayanthi Kyle (Romantica, Black Audience) on vocals and members of Twin Cities rock band The Small Cities - Wes Burdine (guitar, backing vox), Jimmy Osterholt (Bass), Scott Munson (keys), and David Osborn (drums). Every good songwriter must be honest with themselves — or be a master of complete self-deception. Whether Frankie Lee writes his world-weary alt-country songs because he knows how to sing 'em, or the other way around, he's found a calling. On Middle West, Lee fills his mouth with the perfect words to fill out portraits of sorrow, loneliness, blurry memories, and on "Country," the country. "City life just brings me down, all I do is drive around," he argues, with an ache that is palpable for anyone who's felt their life dripping out of them while waiting for an I-94 ramp to start moving. On "East Side Blues," he wrestles with the distances we create for ourselves or have created for us. Lee's songs are about almost nothing. And yet, at the same time, they're also about almost everything. Hosting the night is Rana May, whose deadpan delivery and punk rock sensibility make her comedy different than anything you might have seen before. She has a self-proclaimed issue with authority – but loves dogs – which is why she is so ambivalent about police dogs. Something she loves and hates wrapped up in such a medium fluffy package. Trash Film Debauchery: Satisfying your trash film needs since 2003. This month: Paul Verhoeven's original Robocop (1987). Synopsis: In a dystopic and crime-ridden Detroit, a terminally wounded cop returns to the force as a powerful cyborg haunted by submerged memories.